I love pumpkin soup but wanted to try making it with tofu rather than cream - to get that added creaminess without adding dairy and also because I'm a sucker for experimentation with food. I wasn't sure what I was going to end up with, but the result was delicious. Time to scribble down the recipe I used so I can recreate this later! 1 reduced salt vegetable stock cube - or other stock of your choice. See note. Sweat the onions and garlic with a little olive oil in pot with at least 3.5L capacity. Once the onions have softened, add approximately 1.5-2L water (see note), the rest of the vegetables and the stock cube. Stir well, bring to the boil and simmer, uncovered, for 20 minutes, stirring occasionally. Once all vegetables are cooked, add the tofu. Return to the boil and simmer uncovered for 10 minutes. 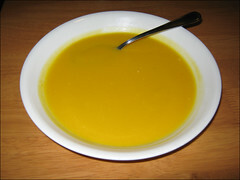 Allow to cool, then blend the soup using a blender or food processor until smooth. Eat when you need something delicious. I use a single stock cube that is meant to make 500mL of stock to 1.5L water in this recipe. Gauge the amount of water depending on how thick you like your soup. Remember you can always add more water if the end result is too thick.